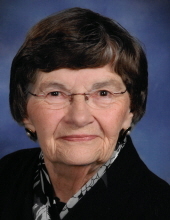 Geraldine Ethel (Clark) Anderson, 91, of Dresser, Wisconsin, passed away peacefully on January 26, 2019. She was born on February 18, 1927 in her childhood home in Dresser. She was baptized and confirmed at Bethany Lutheran Church in Dresser. She attended Dresser Elementary School, Osceola High School, and graduated from Superior State Teacher’s College (now University of Wisconsin-Superior), earning a Bachelor of Science. Geraldine taught elementary school for three years in Beloit, WI, two years at the Polk County Normal School (Teacher’s College), and thirty-five years at Osceola Elementary School retiring in 2000. Geraldine was very involved in her community. She served as member and president of the Business and Professional Women of Beloit, lifetime member and Worthy Matron of the Order of the Eastern Star, member and president of the Dresser Women’s Club, Cub Scout Den Mother, member and Treasurer of Dresser Boy Scout Troop Council. She was a life-long active member of Bethany Lutheran/Peace Lutheran Church, serving on committees, women’s groups, choir, teaching Sunday School, and mentoring confirmation students. Geraldine was a long-term member and president of the Dresser Village Library Board, and was named the 2016 Wisconsin Library Association Trustee of the Year. Geraldine was passionate about teaching young people to read and spending time with family and friends. She also enjoyed spending time at the lake, walking, reading, music, and sports, especially the Minnesota Vikings. She was preceded in death by parents Eugene and Ethel (Gilbertson) Clark, brother Ellis Clark, husband Wilmer ‘Jack’ Anderson, daughter Mary Drinkwine, son-in-law Marvin Drinkwine, son John Anderson, and grandson Duane Rannow. Geraldine is survived by daughter-in-law Cheryl (John) Anderson, their children Diana Rannow, and Tad (Katie) Anderson, and their children Tallis and August; son Paul (Rebecca) Anderson, their children Claire and Hannah; son Mark (Susan) Anderson, their children Sarah, Thomas, Brian and Erin; granddaughter Pam Drinkwine (Jana Rieck), their daughter Brittney Williams and her children Marianna and Dakota. The family respectfully requests that memorials be given to the Dresser Village Library or Peace Lutheran Church. To send flowers or a remembrance gift to the family of Geraldine E. Anderson, please visit our Tribute Store. "Email Address" would like to share the life celebration of Geraldine E. Anderson. Click on the "link" to go to share a favorite memory or leave a condolence message for the family.